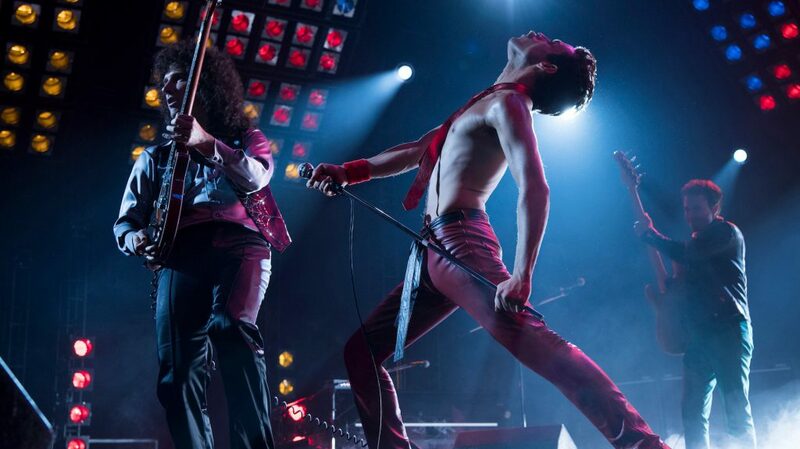 Taking its title from the legendary Queen track, Bohemian Rhapsody chronicles the rise of the popular British band from its early beginnings right through to their incredible performance at the Live Aid charity concert in 1985 while also exploring the personal life of lead singer Freddie Mercury (Rami Malek). While the story for everyone not named Freddie Mercury is a bit light, fans of Queen will revel in Bohemian Rhapsody’s adoration for the Band. It spends ample time on the creation of a number of popular tracks and highlights a number of live performances (with the Live Aid performance being a particular highlight), each one louder than the next. Some are heavily-stylized, and others feel like you’re in the crowd watching the Band rock their hearts out. And considering the participation level of the Band, do not be at all surprised to see the person next to you singing along and rocking out. While it is unclear if this look and feel is courtesy of Director Bryan Singer or his replacement Dexter Fletcher, it is edited quite neatly to the point of never letting on about all the behind-the-scenes drama. Gwilym Lee, Ben Hardy and Joseph Mazzello (little Timmy from Jurassic Park all grown up!) do very well in their performances as Brian May, Roger Taylor and John Deacon, while the Supporting Cast is variably solid (specifically Lucy Boynton as Mercury’s ex-wife Mary Austin). Mike Myers goes nearly unrecognizable here, but has a fun bit part as a fictional record exec (and even gets to make a passing and not at all subtle reference to Wayne’s World). But Bohemian Rhapsody belongs entirely to Malek, who soars as Mercury. I was a big fan of his work before, but this is easily his best performance to date. He lights up the screen from the moment he enters it, and embodies the singer from head to toe. The fashions, the look, the over the top attitude – he nails all of it. While Malek does not get the chance to actually sing (could we even begin to pretend someone can hit those vocal highs? ), he more than makes up for it with an emotional ferocity and passion that goes unrivaled by anyone else. He adds little inflections and idiosyncrasies throughout the Film, and turns what could have been a simple impression into something truly marvelous. Come February, expect Malek to be in the thick of it in the race for Best Actor. For how incredible Malek is, the Film fails him when it attempts to depict Mercury’s life outside of his collaborations with the Band. We are never really offered a sense of who the man behind the music is and what inspires him (outside of one very specific song). We get hints of his family and private lives, but it is all very surface-level. There is no introspection and no attempt to derive a deeper meaning behind his actions. Some have accused the Film of being homophobic and demonizing his bisexuality – going so far as to depict his lover and former manager Paul Prenter (Allen Leech) as a villain. But his relationships and sexuality are glazed over more often than not, in favour of spending more time with the band. All of these elements should be compelling, but they just come off as a compilation of life events pasted in around the elaborate music sequences. They exist because the Filmmakers had to address them, not because they truly wanted to. In some shape or form, Queen has undoubtedly affected your life. One of my all-time favourite songs is Don’t Stop Me Now. A go-to song during drunken Karaoke nights with my friends was Bohemian Rhapsody. Everyone has a story – and for that reason alone, many will be able to look past the story’s contrivances and just have a blast rocking out with Freddie and the band. And the musical performance sequences, specifically the last portion of the Film at Live Aid, are among some of the most electric of the year. Couple that with Malek’s spectacular performance, and you have the first must-see film of the holiday season. 20th Century Fox Canada release BOHEMIAN RHAPSODY on Friday, November 2, 2018.